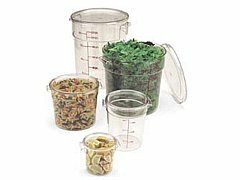 Round Food Storage Containers - Clear 12 Qt. The standard in food storage. Camwear Round Storage Containers are so handy! You can store ingredients or transport ready-to-serve or partially prepared foods. And, you won't be guessing about what's inside because they're completely clear. The imprinted graduation marks let you know exactly how full they are too. The round shape promotes proper air circulation. The durable polycarbonate construction is virtually unbreakable. Plus, it withstands temperatures of -40 to +210, so you can use them in just about any condition. Food acids, oils and alcohol won't stain or harm them. The molded-in handles offer convenience in lifting. Which is handy because they stack so well. Covers are available for easy transporting (covers sold separately). It's hard to imagine a more versatile foodservice product. This product was added to our catalog on 06/02/2005. Cambro Round Clear Cover for Storage Containers 12,18,22 Qt.